What divides them is what unites them. About 45 kids from various high schools across Grand Rapids get into rowing shells and become a team. They have no school spirit to work with, no school mascot to rally around. This is about building teamwork, camaraderie, and ultimately, tapping competitive spirit. After practicing together four evenings a week for nine weeks, two hours at a time, they learn to row in sync and become a crew. When they step into a boat at a regatta, it’s not about being from Ottawa Hills or City High School – it’s about being from Grand Rapids Crew. Besides City and Ottawa Hills, kids on the Grand Rapids Crew come from Catholic Central, Grand Rapids Christian, West Catholic, and suburban schools like Comstock Park and Kenowa Hills. Some are also home schooled. This is also recruiting time, so the list of schools may grow. Landon Bartley, men’s varsity coach, says they’ve always been a community program, accepting kids from wherever in the Grand Rapids area there is interest. Rockford, Forest Hills, and East Grand Rapids all have their own programs with school identities. Not so with Grand Rapids. “We’ve never had a problem with kids from other schools,” he says about kids who dig meeting other new kids. “We say, ‘You wanna beat Rockford?’ and they say, ‘Yeah!’” In rowing, it’s boat against boat." This Tuesday, Bartley is training nine boys in the men’s varsity crew, eight in the rowing shell and one watching from the coachs’ launch. Ann Burton is the women’s varsity coach, who is training two girls in the women’s varsity crew, both in a double. “Most of my girls are in swimming right now,” says Burton, “and that’s okay. I’d rather have them participating in a sport where they can earn a letter. Our program can’t do that for them.” Those girls will rejoin the rowing crew in the spring, when swimming season ends. That’s the most competitive time for rowing, when you need a strong, committed crew. Bartley and Burton track the boats up and down the Grand River in a used launch. Calm, peaceful, and quiet except for the noise of the launch motor and the splash of oars, the Grand River is ideal for rowing. Burton pilots the launch, shouting corrections to the two girls in the double. Bartley guides an eight practicing on the other side of the launch. He uses a bull horn to shout instructions. At the beginning of the season, they’re working on basic leg-back-arm technique. The coaches are patient, their tone friendly but in charge. They observe each other’s crews and work as a team, making suggestions to each other. The eight is practicing four oars at a time, so half the boat is working, half the boat is waiting. The kids are good natured. These are typical high school kids with class loads, home work assignments, and chores. However, when they’re on the water, they become athletes honing skills. They train like athletes for any other sport. Rowing isn’t just about fitness, it’s about discipline and focus on technique. That’s why crews go over countless drills during training. Use of legs, then backs, then arms – in unison – is key to a powerful stroke. The fall is breaking-in time for novice crews, who learn about the boats and equipment, the rowing stroke, and safety before they ever get on the water. In fact, no one gets on the water until they prove they can swim. They begin rowing in single shells to see how a boat handles and to learn how to handle oars. They may also move up to doubles or pairs. Eventually, coaches begin organizing young men or young women into boats as crews as they show their mettle. For varsity crews, autumn is time for getting back into the rigors of rowing after a laid back summer. Training begins light, but before long they’re doing longer stretches of faster sets. Each oarsman is assigned a seat on the boat, a position that may change depending on the oarsman’s strengths and weaknesses. They learn to work in rhythm, many-as-one in search of a common goal: unity. The ultimate goal in the fall is to compete in upcoming regattas, called head races: the first one occurs at Forest Hills Boat House on October 10 and a second one at Riverside Park October 24 hosted by the Grand Rapids Crew, and then they travel to a final regatta in Wyandotte, Michigan, in November. In a head race, individual boats compete against the clock, and the best time wins the class. The sun snuggles toward the horizon as the launch and shells pull up to the dock, oars are freed from their oarlocks, and rowers heft the equipment the long walk back up to the boathouse. 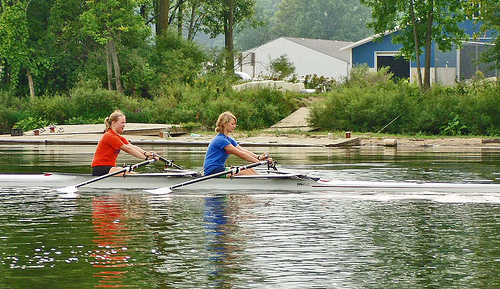 The Grand Rapids Crew operates out of the Grand Rapids Rowing Association facilities in Comstock Park, just upstream from the original Boat and Canoe Club in North Park. Practices are Tuesday and Thursday evenings and Saturday mornings. This crew will pick up in a couple of days where they left off, building teamwork, camaraderie, and competitive spirit. As a former rower (seat 4 in an eight), I am pleased as punch that one of the first articles is about rowing. It's an extraordinarily under-reported sport, but GR is such a great place for it.